We have plenty of construction and renovations volunteer opportunities in place to improve local homes, schools and public buildings.You will work to build, create, repair, paint, renovate, or make improvements to different places within the communities to improve the village or town and overall morale. In the past, our volunteers have had a positive effect on the community, and the local citizens really appreciate the program. Volunteers in this project will be expected to be open minded, patient, caring, and self-starters (able to recognize what needs to be done or who needs to be helped). 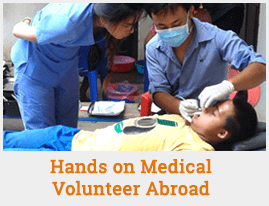 Volunteers are expected to maintain a helpful and professional attitude. In the construction project, volunteers will participate in various constructions projects. Some of the projects range from repairing and building new homes and schools in rural villages and towns. Some duties may include digging, removing dirt, carrying bricks, mixing cement, plastering, painting, cleaning and other various needs.